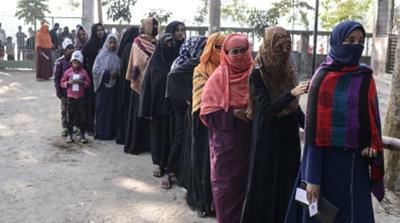 Dhaka, Bangladesh – Prime Minister Sheikh Hasina’s astronomical victory in Bangladesh‘s general elections, analysts and opposition leaders say, will turn the South Asian country into a “one-party state”. The Grand Alliance led by the ruling Awami League (AL) party bagged 288 seats, leaving just 10 seats for others, including seven seats for the main opposition alliance led by the Bangladesh Nationalist Party (BNP). Voting was cancelled on two seats. In the 350-member parliament or Jatiya Sangshad, 50 seats are reserved for women. Shahab Enam Khan, Professor of International Relations at Dhaka-based Jahangirnagar University, said: “the election result didn’t come as a surprise”. “The widely reported electoral irregularities, deaths and violation of laws bear the testimonies of fragile democratic institutions in the country. While the ruling party will continue to find solace in its astronomical victory, the opposition has to take responsibility for its own political defeat too,” he said. “The cumulative result will naturally push Bangladesh into a one-party state, which, if remained unchecked, may further strengthen the culture of impunity in the form of partisan interests,” he said. The Jatiya Oikya Front, the main opposition alliance led by the BNP, rejected the election results accusing the government of orchestrating vote rigging and ballot stuffing. The opposition said the government denied them a level playing field during the campaigning, with mass arrests of its workers on what it called trumped-up charges. It added that many of its candidates were attacked by the ruling party workers leading up to the polls. In 2014 too, the BNP boycotted the general elections, which observers had called an “electoral farce”. Kamal Hossain, 82, the convener of the opposition front and a former Hasina ally, on Monday, called for reelection – a demand swiftly rejected by the Election Commission. “We’ve had bad elections in the past but I must say that it is unprecedented how bad this particular election was,” said Hossain, who emerged as the face of the opposition. Rights bodies and western powers have echoed the opposition concerns regarding election day violence, which claimed 17 lives, and voting irregularities. “An independent and impartial commission should investigate the serious allegations of abuses” in the elections, Human Rights Watch said on Wednesday. But the government maintains that people voted for the ruling party for the development work carried out in the past 10 years. “What do people want? They want to fulfil their basic needs. When they feel that yes, only this government can ensure it, then definitely they will vote for us,” Hasina, 71, told foreign journalists and election observers a day after the results were announced. In Dhaka, critics of the government say there is a “climate of fear”. A growing number of activists, journalists and academics have resorted to self-censorship to avoid reprisals from the Hasina government. Arup Rahee, singer and activist based in Dhaka, fears freedom of expression will be further curtailed under the new government. 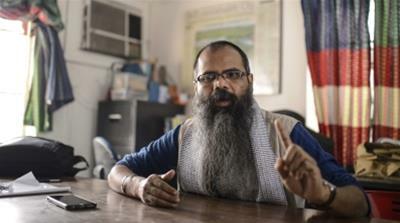 “There is an environment of self-censorship across the board, which people fear may intensify in the near future,” said Rahee, with a flowing beard sitting in his office in Dhaka. Hasina government and its supporters have pushed the narrative of rapid economic growth and expanding garment exports that have lifted tens of thousands of people out of poverty. Bangladesh, a poor country of over 160 million people, has seen its per capita income tripled under her tenure. The government has accused critics, who have raised concerns over inequitable development, as serving vested interests. “It is not healthy when only one narrative of democracy is promoted. There must be a space for dialogue between different narratives to take place. That only can ensure a healthy and just democracy in a society like Bangladesh,” Rahee, the singer-activist, said. Mujahidul Islam Selim, the president of the Communist Party of Bangladesh (CPB), said Bangladesh is passing through a “crisis of democracy”. The CPB unsuccessfully contested in 74 constituencies – a result Selim blamed on the “farcical elections”. Of the 39 parties that participated in the elections, only nine could find representation, with an overwhelming 96 percent of the seats going to the ruling alliance. “Even though we are supposed to have a multi-party democracy, we have unfortunately failed to institutionalise it,” Selim told Al Jazeera. He believes that the ruling party has been appropriated by the top one percent of the wealthy Bangladeshis, who have disproportionately benefited from the high economic growth of the South Asian nation in the last decade. “The economy has been growing at a rate of almost 7 percent. But the real income of the 99 percent of the people has grown only marginally. “Where does the rest of the wealth go? It goes to a small section. And this small section has now captured power and trying to perpetuate its rule,” the communist leader said. Mahbubul Haque Hanif, the Joint General Secretary, of the Awami League admitted that “it’s not healthy for a democracy without an opposition” but blamed the BNP for failing in their role as an opposition party”. “We do not need an opposition that sets fire to public properties, buses, trains, and kill people,” he said. He rejected that Hasina government is “authoritarian”. “You can see we have [a] lot of TV channels, where talk show participants criticise the government on many points,” he said. “In Bangladesh, there is a culture that the defeated parties point fingers at the government and the election commission,” he said. But the fears are not unfounded, on Tuesday, a local journalist Hedayet Hossain Mollah was arrested in Khulna and another one is on the run for reporting election irregularities. The Committee to Protect Journalists (CPJ) has called for his release. “Arresting a journalist for reporting on alleged election irregularities and raising legitimate questions is a disappointing way for Prime Minister Sheikh Hasina and the Awami League party to respond to their re-election,” CPJ Asia Program Coordinator Steven Butler said in a statement. One local journalist quipped it is “Her Majesty’s” rule in Bangladesh, referring to Hasina, who wields complete control on the party that fought for the liberation of the country in 1971. A former Member of Parliament from the BNP said Hasina is taking the country towards one-party state – something her father and the country’s founding father had proposed before he was assassinated by military officers. Selim of the communist party said that there is no opposition in the parliament but he hopes the “opposition will come from the society”.